Speculation cannot affect prices very much. Fear about future troubles in oil producing countries add to the price of oil. How can these two ideas be reconciled? 133-40: "Since the late 1980s, a consensus has emerged that the decline in real wages for low-skilled workers in the early 1980s and the subsequent slow recovery of these wage levels are explained by skill-biased technological change. In this chapter, we have argued that the evidence underlying this consensus is remarkably frail. Much of the evidence takes the form of "proof by residual." After accounting for changes in relative supply and (in some cases) making a modest list of other factors, proponents of this consensus note that the decline in the relative wages of low-skilled labor remains unexplained. Skill-biased technological change is then left as the only plausible explanation for the facts. Given the state of knowledge about how labor markets work, we find this line of argument unconvincing. Moreover, the evidence that emerges from such an exercise is highly model-specific. Depending on how the data for different groups are organized, the degree of substitution that is allowed between workers of different genders or ages, and the list of other job characteristics that are included in the decomposition, the results can suggest that rising inequality was either an ubiquitous phenomenon affecting virtually all workers over the past three decades or a trend that mainly affected young workers in the early 1980s." Card, David and John DiNardo. 2006. "The Impact of Technological Change on Low-Wage Workers: A Review." In Rebecca M. Blank, Sheldon H. Danziger, and Robert F. Schoeni, editors. Working and Poor: How Economic and Policy Changes Are Affecting Low-Wage Workers (New York: Russell Sage Foundation): pp. 113-140. I have rewritten the introduction for my new book again, although the first chapter is unchanged. I think that the focus is much stronger. Thanks to Jim Kirby and the others for their suggestions. Any more comments would be appreciated. Wall Street Journal Evidence That Speculators Are Responsible for the Run Up in Oil? The Journal article does not discuss oil, but chocolate. Even so, the article is of interest because it dismisses the idea that fundamentals are responsible for a rapid increase in prices. The only speculator quoted responded that speculation can only cause higher prices in the short run because farmers can plant more trees. How long does a tree take to mature. Patrick, Aaron O. 2008. "Candy Companies Blame Higher Prices On Hedge Funds' Chocolate Cravings." Wall Street Journal (28 May): p. C 1. Soaring cocoa prices are driving up the cost of chocolate around the world. The chocolate industry points its finger at speculative buying by professional investors, especially hedge funds. "They definitely influence the market and the prices," says Bernd Rossler, a spokesman for August Storck KG, one of Germany's bigger chocolate makers. "There is a lot of money invested in [cocoa], and it is coming from hedge funds." Shipped around the world as a powder, paste, liquor or butter, cocoa sells for about $2,600 a metric ton on New York's Intercontinental Exchange, up from $1,700 at the beginning of 2007. Cocoa investors acknowledge that they can affect prices but say their influence is strictly short term. Any increase in prices should lead to farmers growing more cacao trees, which produce cocoa beans, driving prices down again, they say. One of the puzzles behind the cocoa-price increase is that it doesn't appear to reflect an imbalance between supply and demand. In the year ending in September, there will be almost enough cocoa grown to meet the world's needs, according to the International Cocoa Organization, a trade group. The expected 51,000-metric-ton shortfall isn't particularly large and can easily be covered by existing stock, the group says. "The fundamentals do not justify this price, and I haven't heard of any other explanation other than [investment] funds," says Hagen Streichert, a German government official and the spokesman for cocoa-buying countries on the International Cocoa Council. 1. If you have a national cap, you have a national cap. Enforce it and people’s carbon emissions have to fall in line according the laws of arithmetic. 2. How on earth are you going to put carbon prices on each and every personal decision, especially if you take life-cycle and indirect effects into account? After all those years of Maggie channeling Hayek you’d think the basic lessons of the socialist calculation debate would have rubbed off. 3. The more upstream the cap, the more flexible and efficient the system will be. Capping each individual’s consumption is as downstream as you can go. Upstream capping means that the advantages of shifting the economy across sectors, technologies and the like would be transparent and seamless: if the higher cost of carbon results in an investment in rail transport being more productive than one in highways, you can transfer the resources and adjust in a lower-cost way to the cap. If you have separate caps for separate activities this visibility and flexibility is lost. 4. And the whole scheme is based on the misperception that an economy-wide carbon tax—or even better, an economy-wide cap—bleeds households. Yes, of course, taking money from households would do this, and the tax/cap would function much like a regressive sales tax. But wait: the money has to go somewhere. The simple solution is to give it back on an equal per capita basis. This reimburses the public and turns a regressive transfer into a highly progressive one. Much more sensible, I would say, than moralism run amok. David Warsh on the JMU economic complexity conference: "A Brave Army of Heretics"
David Warsh has posted an 8-page discussion of the conference held on May 17 at James Madison University in Harrisonburg, VA that John Horgan has also discussed ("chaoplexity," not my "chaoplexology"). Warsh discusses broader issues of complexity, but also declares that when he came to the conference he was "slightly surprised at the real progress that had been made..." His article is available in the latest issue of the independent weekly, Economic Principals, under the title of "A Brave Army of Heretics" (which comes from a passage in Keynes's General Theory). Warsh's posting has also been linked on Economist's View run by Mark Thoma. I have to thank Dave for his kind remarks about me and Mark for giving the whole thing more publicity. Warsh's post provides lots of links, including to my earlier post here and John Horgan's post. In Friday's (May 23) Washington Post Business section there was a story by Frank Ahrens, "More Than 100 Post Journalists Take Buyout," the third round of these, which will reduce the staff from about 780 to around 700. This is in response to declininig circulation, which peaked at 832,232 in 1993 and is now down to 638,300. Among those taking these early retirements and not being replaced are Pulitzer Prize winning foreign correspondent Thomas Ricks, even better in my view foreign correspondent Nora Boustany, Pulitzer Prize winning movie critic Steven Hunter, music critic Tim Page, and Maralee Schwartz and Tony Reid from the Business section. The most prominent retiree will be the increasingly blovious David Broder, although he will still lurk about "on contract." Brad Delong may crow about the "death spiral" of the Post (and the NY Times), but I am not at all. This will be a severe loss as Americans will be further cut off from independent reporting of foreign news events. The coverage of such events in the American media is already about as limited and distorted as what one used to get if one lived in the USSR. I am someone who gets WaPo delivered to my door in Harrisonburg, VA. If it were to go the alternatives would be the Washington Times and the Harrisonburg Daily News-Record. The latter is quite reasonably moving towards covering mostly local news. While its editorial page writer has gone off the deep end, putting himself far to the right of George W. Bush on global warming, among other things, at least the DNR has an array of views presented in the columnists who appear there, whereas the WT is so uniform in its columnists it makes Fox News look like Le Monde Diplomatique. As it is, I fear that WaPo has decided to become a local Washington newspaper, which at least means there might still be good coverage of national political news from there, even if its global and other coverage deteriorates further. I note another issue of relevance to Brad Delong and bloggers. There is this idea in the blogosphere that it will replace the print media. However, I note that much of what appears in blogs ultimately comes from the print media. I was made all too aware of this several years ago when on maxspeak I broke the story of the mistreatment by federal prosecutors of the Harrisonburg Kurds. This blew all over the world, but many, such as the Volokh Conspiracy, questioned whether it was even happening. Was I lying? It was not until we could find a small back page story from the Harrisonburg Daily News-Record confirming that there was a prosecution of Kurds (and which totally reflected the prosecution's view), that the blogosphere accepted that this was really going on, and in the end the blowback from the blogosphere then played a role in bringing print media attention in Harrisonburg and elsewhere to what was going on, eventually leading to a much more favorable outcome in the courts. Could Someone Explain Stolper-Samuelson to James Surowiecki? And why does Greg Mankiw endorse this stuff? The candidates are trying to win the favor of unions and blue-collar voters in states like Ohio and West Virginia, of course, but their positions also reflect a widespread belief that free trade with developing countries, and with China in particular, is a kind of scam perpetrated by the wealthy, who reap the benefits while ordinary Americans bear the cost. It’s an understandable view: how, after all, can it be a good thing for American workers to have to compete with people who get paid seventy cents an hour? As it happens, the negative effect of trade on American wages isn’t that easy to document. The economist Paul Krugman, for instance, believes that the effect is significant, though in a recent academic paper he concluded that it was impossible to quantify. But it’s safe to say that the main burden of trade-related job losses and wage declines has fallen on middle- and lower-income Americans. So standing up to China seems like a logical way to help ordinary Americans do better. But there’s a problem with this approach: the very people who suffer most from free trade are often, paradoxically, among its biggest beneficiaries. The reason for this is simple: free trade with poorer countries has a huge positive impact on the buying power of middle- and lower-income consumers—a much bigger impact than it does on the buying power of wealthier consumers. The less you make, the bigger the percentage of your spending that goes to manufactured goods—clothes, shoes, and the like—whose prices are often directly affected by free trade. An increase in the price of a good will cause an increase in the price of the factor used intensively in that industry and a decrease in the price of the other factor. In fact, as the price of apparel declines from free trade with China, the wages of apparel workers fall by more than the prices of apparel so the real wages of apparel works decline. Somehow it seems that James Surowiecki never grasped this proposition. War For Oil, Or Oil For War? The Wall Street Journal has an article suggesting that the military consumes 340,000 barrels of oil a day, compared to Iraq's 2.4 million; and that the Defense Department paid $13.6 billion for energy in 2006. I suspect that these figures would be what uniformed personnel consumed. Maybe somebody here knows, but I feel fairly confident that contractors in Iraq -- even contractors carrying out military missions -- consume oil that escapes these estimates. Wasting oil is nothing compared to wasting lives, but even so I can think of better uses for 340,000 barrels of oil a day. Dreazen, Yochi J. 2008. "U.S. Military Launches Alternative-Fuel Push Dependence on Oil." Wall Street Journal (21 May): p A 1. U.S. military consumes 340,000 barrels of oil a day, or 1.5% of all of the oil used in the country. The Defense Department's overall energy bill was $13.6 billion in 2006, the latest figure available -- almost 25% higher than the year before. The Air Force's bill for jet fuel alone has tripled in the past four years. When the White House submitted its latest budget request for the wars in Iraq and Afghanistan, it tacked on a $2 billion surcharge for rising fuel costs. Just as important, the military is increasingly concerned that its dependence on oil represents a strategic threat. U.S. forces in Iraq alone consume 40,000 barrels of oil a day trucked in from neighboring countries. The Air Force wants to be able to purchase 400 million gallons of synthetic jet fuel a year by 2016, an amount equal to 25% of its total fuel needs for missions in the continental U.S. This year, it expects to buy slightly more than 300,000 gallons. Economics textbooks throughout the first half of the 20th century -- right up to and including Paul Samuelson's widely-adopted textbook of the 1950s and 60s -- repeatedly stressed the fallacy of union "theories" underlying their agitation for shorter hours. According to those textbooks, the fallacious union rationale for shorter working time was based on the assumption (the "lump-of-labor fallacy") there was only a fixed amount of work to go around and that if each worker did less of it, more could be employed. Where did this alleged "union theory" come from? The most likely suspect would appear to be the writings of George Gunton. Gunton, a disciple of shorter hours pioneer Ira Steward, was commissioned in 1889 by Samuel Gompers of the American Federation of Labor to write a pamphlet, "The Economic and Social Importance of the Eight-Hour Movement," outlining his theory of the eight-hour system. Gunton's pamphlet was thus the authorized statement of union reasoning behind their eight-hour campaign. Furthermore, in his pamphlet, Gunton claimed that if the eight-hour system were generally adopted in the US, the demand for workers would be increased by an amount approximately equal to the number of hours withdrawn from the market by currently-employed workers. This claim was soon rebutted by John Rae who pointed out that the redistribution of hours of work was "not a simple sum in arithmetic." Even conceding that Gunton's claim does indeed look suspiciously like a theoretically-naive "simple sum in arithmetic," it is, nevertheless, more of a digression from Gunton's overall argument than its culmination and conclusion. What Rae did, in his retort to Gunton, was to ignore Gunton's own argument and retrofit a correspondingly simplistic argument to the obviously simplistic claim. Subsequent textbook authors followed suit, albeit with even less attention to the integrity of the original source. If we were to assume that textbook authors knew what they were doing in passing along the lump-of-labor claim, it would most accurately be described as dissembling and propaganda. However, it is more likely that the episode is simply one of arrogant prejudice swallowing its own tale. Despite his lapse of making a sweeping and perhaps preposterous claim about the immediate results of the general adoption of the eight-hour system, Gunton's economic argument for the eight-hour system is actually rather sophisticated and dynamic -- much more so than what came to be the standard textbook treatment of the issue of shorter working time. What was Gunton's argument, then? Briefly, Gunton argued that it is final demand that ultimately determines the amount of goods that can be profitably produced and sold and that the benefits of increased use of capital equipment derive from increasing returns to scale of production. Proceeding from those principles, it followed in Gunton's argument that higher wages and expanded employment would result in increased consumption which, in turn, would enable intensified use of machinery and thus a lower per-unit cost of production. As a consequence, under Gunton's assumptions, it is not necessary that the higher wages infringe on profitability. Whether or not Gunton's assumptions hold up under rigorous scrutiny, they are unmistakably dynamic assumptions rather than static ones. The charges that they assume a fixed amount of economic activity, exhibit antipathy to technological improvement or call for restriction of output by workers are 180 degrees wide of the mark. And, remember, this is the official statement issued by the leading national organization of trade unions of the theory behind their eight-hour day campaign. To credibly attribute some other motive or theory to unions would require -- at the very least -- either the citation of some other supposedly authoritative source or an explication of the discrepency between the trade unions’ stated rationale and their actual theory as demonstrated by practice. Do the textbooks do this? No. In fact, most accounts go no farther than to refer to the lump-of-labor theory/fallacy as if it were an uncontested fact that unions subscribed to it. In other words, whilst Gunton’s theory is at least plausible, the textbook accounts of the lump-of-labor are utterly unfounded. It is the legacy of that unfounded hearsay that continues to echo, uncorrected and generally unquestioned, in mainstream analyses of policies for the reduction of working time. John Horgan on "Can Chaoplexology Save Economics?" Attending the conference I hosted at JMU over the weekend was the former Scientific American editor, John Horgan, who also wrote the bestselling _The End of Science_ a bit over a decade ago. Among the things he blasted in that book was what he called "chaoplexology," or what most of us would call complexity, including in economics, although more broadly. Anyway, I invited him to attend "Transdisciplinary Perspectives on Economic Complexity," and he did, providing a lively and interesting gadfly role. For those who are curious, he has reiterated his skepticism along with a lively report of the conference on his blog. He is currently a professor of scientific communication at the Stevens Institute of Technology. Tomorrow (May 20) there will be a memorial at 4 PM at the John Jay College of Criminal Justice in New York at 899 Tenth Avenue (west side of Tenth Avenue between 58th and 59th Streets), Room 630. He was a longtime member of the economics department there who died on Feb. 20, although he had been seriously incapacitated since a stroke in 1991. Duncan Foley and James Galbraith will be among the speakers, and there will be an open mike at 5 PM for people to speak on "Peter as we knew him." Duncan Foley put together a set of his papers that were published in 1998 by Princeton University Press as _Barriers and Bounds to Rationality: Essays on Economic Complexity and Dynamics in Interactive Systems_. Below the fold I put a summary of some remarks about Peter that I have asked Duncan to make on my behalf as I shall not be present. This is a shortened version of my remarks to be presented. I note that I always found him to be a warm and genuine person of great principle, thoughtfulness, and kindness. I then note three innovative contributions to economics he made. 1) His 1975 paper in Kyklos, "Reswitching: An Empirical Observation, A Theoretical Note, and an Environmental Conjecture," in which he showed he was the first to propose an empirical example of capital theoretic paradoxes and how they could relate to environmental issues, an application that may be made to the global warming debate. 2) His 1982 paper in Mathematical Social Sciences, "The Metalogic of Economic Predictions, Calculations, and Propositions," which was the first to study the implications for economic analysis and its limits of the Goedel Incompleteness and Inconsistency theorems. This was a foundational paper for the analysis of computational complexity in the economy. 3) His 1983 paper with Farrokh Hormozi in Mathematical Social Sciences, "Theoretical Reconciliation of Equilibrium and Structural Approaches," that was one of the first to apply cellular automata to studying economics, focusing on the coevolution of technology and institituions with catastrophe theory playing a role at critical points of discontinuos change in the evolution. I shall also note here that I hosted a conference on May 17 on my campus on "Transdisciplinary Perspectives on Economic Complexity," which dealt with many of these themes, and which Duncan Foley participated in. Diamonds Are Forever, Wars Are Not: Is Conflict Bad for Private Firms? Every once in a while The American Economic Review publishes something interesting. A recent article gave pretty solid evidence that the Civil War promoted by Jonas Savimbi raised profits for the diamond industry. A long-standing theory in economics is that peaceful development is in the interests of business. 18th century theorists use to write about "sweet commerce." But Savimbi offered business the opportunity for an alternative government to bid against the Angolan government, thereby converting government rents into profits. Once peace broke out, the levels profits subsided. Guidolin, Massimo and Eliana La Ferrara. 2007. "Diamonds Are Forever, Wars Are Not: Is Conflict Bad for Private Firms?" American Economic Review, 97:5 (December): pp. 1978-1993. 1978: "... the Angolan civil war suddenly ended with the death of the rebels' leader, Jonas Savimbi, on February 22, 2002. This allows us to conduct an event study to assess investors' reactions to an exogenous conflict-related event, and one in which one party gained an unambiguous victory over the other. Restricting our analysis to the diamond mining sector is useful because, unlike oil production sites, which are located offshore and were removed from the fighting in the mainland, the activities of diamond extracting firms were located in areas very much at the heart of the conflict. A priori, one would therefore expect the (negative) impact of the war to be maximal for these firms." 1978-9: "Our main finding is that the cumulative abnormal returns of "Angolan" stocks experienced a significant drop in correspondence to the end of the conflict, while those of a control portfolio made of otherwise similar diamond mining companies not holding concessions in Angola did not. In other words, international stock markets perceived Savimbi's death (and later the ceasefire) as "bad news" for the companies operating in Angola, but not for others. On the event date, the abnormal returns of the "Angolan" portfolio declined by 4 percentage points, and the difference between "Angolan" and control abnormal returns was 27 percentage points. This suggests that, no matter how high the costs to be borne by diamond mining firms in Angola during the conflict, the war appears to have generated some counterbalancing "benefits" that in the eye of investors more than outweighed these costs. Although our result is based on a small sample of seven firms that were operating in Angola and were also listed on major international stock exchanges, this is a (sad and) striking result which suggests that much of the wisdom on the incentives of the private sector to end conflict may need closer scrutiny. We offer a number of interpretations for our finding, including the fact that during the conflict: (a) entry barriers for new diamond producers were higher; (b) the bargaining power of Angolan authorities was lower, hence licensing (and rent-seeking) costs for incumbent firms were lower; and (c) the lower transparency standards permitted by the ongoing war allowed for relatively profitable unofficial dealings." 1979: "The second branch of literature concerns the role of natural resources in civil wars. This literature, started by the work of Paul Collier and Anke Hoeffler [Collier, Paul, and Anke Hoeffler. 1998. "On Economic Causes of Civil War." Oxford Economic Papers, 50(4): 563-73. ], investigates whether natural resource abundance increases the likelihood of conflict onset, as well as conflict duration." see also Ross, Michael L. 2004. "What Do We Know about Natural Resources and Civil War?" Journal of Peace Research, 41(3): 337-56; and Miguel, Edward, Shanker Satyanath, and Ernest Sergenti. 2004. "Economic Shocks and Civil Conflict: An Instrumental Variables Approach." Journal of Political Economy, 112(4), 725-53. 1979-80: "Following its independence from Portugal in 1974, Angola was plagued by a long and cruel civil war between the Movimento Popular de Liberta‡ao de Angola (MPLA) and the Uniao Nacional para a Independencia Total de Angola (UNITA). In September 1992, national elections were held and Jos‚ Eduardo dos Santos, leader of the MPLA, won by a slight margin. This victory was never recognized by UNITA's leader, Jonas Savimbi, who initiated a civil war that was perceived by many as driven by his own desire of political power as much as by ideology. Throughout the war, UNITA's military strategy was aimed at occupying the areas of highest concentration of diamond mines and at using diamond sales to finance weapons purchases. The MPLA relied mostly on oil for financing its military operations through the Fuerzas Armadas de Angola (FAA), while also earning money from official diamond concessions. As part of the Lusaka Peace Protocol, in 1994, UNITA was given legal rights to mine and to form partnerships with foreign companies. The peace process collapsed in the summer of 1998, however, when the rebels returned to massive attacks against the military and civilians. The years between 1998 and February 2002 marked the last phase of the Angolan conflict and constitute the sample period on which our empirical analysis focuses. During these years, many commentators talked about a "military stalemate" between government and rebel forces. On February 22, however, Jonas Savimbi died in an ambush 100 kilometers from the Zambian border. Six weeks later, on April 4, the cease-fire was signed." 1980: "Since the beginning of the war, there was a close link between conflict and the diamond industry in Angola. Angolan diamonds have traditionally been mined in alluvial deposits, where capital investments take the form of light machinery and river diversions, and production was relatively easy to control by rebel forces. The key role of diamond sales in financing UNITA's operations has brought the problem of "conflict diamonds" to the attention of the public. To give an idea of the importance of the sector, Angola is the fourth largest diamond producer by value in the world, largely because most of its production is of gem quality. Angolan diamond sales in 2000 reached $1.1 billion, i.e., 15 percent of the world production of rough diamonds. This amount was almost equally split between official industrial production, official artisanal production, and illegal production. It is estimated that between 1992 and 1997, when UNITA controlled most deposits in the Cuango valley, the rebel movement supplied between 8 and 10 percent by value of the rough diamonds on the world market (Tony Hodges 2004, 174-77). 1980: "Diamond production and marketing in Angola have traditionally been controlled by the stateowned company Endiama through joint ventures. The diamond law passed in 1994 established that in order to obtain mining rights, foreign companies had to form a partnership with Endiama and with at least one other Angolan company, and get approval of the Ministry of Geology and Mines. This led to the proliferation of local mining companies owned by well-connected Angolans, who obtained concession rights for nominal fees and then sought lucrative partnerships with foreign companies. Many army generals also benefited from the situation by establishing private security firms that were contracted by the mining company being awarded the concession, sometimes as an implicit part of the deal. These high hidden costs restricted participation in diamond mining in Angola to a relatively small number of industrial companies and a large number of artisanal miners (garimpeiros)." 1980: "Between December 1999 and February 2000, the Angolan diamond industry underwent further restructuring. First, the government created a marketing monopoly in which all Angolan diamond production would be bought and resold by the Angola Selling Corporation (Ascorp). This was a joint venture between the state-owned Sodiam (51 percent) and two foreign companies with strong political connections, Welox and Tais. The creation of Ascorp was perceived as a serious blow to major international companies operating in Angola, primarily to De Beers. Another reform in early 2000 suspended all contracts that had been signed between Endiama and other mining companies and expropriated prospecting concessions exceeding 3,000 square kilometers. Needless to say, these reforms were not welcomed by existing companies, which saw their contracts unilaterally renegotiated. Since the end of the war, the situation has not changed significantly. Partnerships with local companies remain a cornerstone of the Angolan diamond industry, and the government has established a security body that has been seen by many as an attempt to centralize control of diamond production under domestic intelligence services." 1986: ""Mining companies are condemned to operating wherever they find minerals. They can consequently find themselves in the middle of conflicts that have erupted around them. In some instances they also deliberately enter conflict zones as part of a high risk-high profit strategy to exploit areas lacking competitors, or to gain a toehold before competitors arrive." (Oxford Analytica, Congo-Kinshasa: Resource sector brings political risks, 20 July 2005)." 1986: "A concise quote from a local source is possibly more explicit: "The end of the war in Angola means that right now the main institution in the country is corruption." Quote by Rafael Marques, a dissident journalist from Luanda. Reported by Tim Butcher in "As guerrilla war ends, corruption now bleeds Angola to death." www.telegraph.co.uk, 30 July 2002. 1986: The civil war created "a price war between the government and UNITA over the concession of mining rights. The length of the conflict, and the withdrawal of the external funding that had helped both sides during the Cold War, put increasing pressure on the two parties to obtain immediate revenue. This is likely to have shifted bargaining power in favor of firms and allowed them to strike better deals. This was particularly true in the case of UNITA after the imposition of UN sanctions that rendered dealing with rebel forces illegal and forced them to do business on terms very favorable to the buyers. Indeed, industry sources suggest that working under UNITA protection was a particularly cheap way to extract diamonds: "According to one former garimpeiro who worked in the twilight zone between UNITA and government control, foreign dealers paid $250 to UNITA for prospecting rights" (Justin Pearce 2004, 4). The end of the war would dramatically decrease the demand for weapons (and for immediate revenue) by the two parties and thus increase firms' licensing costs. Through this channel, company profits would have decreased after Savimbi's death even if the extent of regulation and rent extraction by the government had not changed." I have a student -- a young woman -- from Saudi Arabia. The first day she showed up in class wearing traditional headdress. Then I never noticed her again, because she changed her style of dress. She showed up in my office after missing the first midterm, telling me a horrible story. I had trouble understanding everything, so I probably have some of the facts mixed up. She had been missing class because some of the young Saudi men had been harassing her. She explained that she had won a scholarship. Apparently, she committed a grave crime. She was not allowed to come to this country without a male guardian. Her father gave him permission, but the government told him that that was not his choice. Her brothers did not want to accompany her, but she came anyway. She did not come from a wealthy family and felt like she had earned her scholarship. On the campus, from what I understand, many of the young Saudi men like to party, but uphold strict moral standards for women. Because my student did something unthinkable, they harassed her, threatened to cause trouble for her family, and reported her to the Saudi government -- which demanded that she return to her homeland. We have a wonderful new Pakistani professor to whom I introduced my student, suggesting that the professor would be more understanding of her situation and knowing that she could open up more easily to a woman. Afterwards, the professor asked me if I knew what was happening to the student. I replied that I was aware of the harassment. She shook her head and said, "Oh, no." Even before as anything, she explained that she could not tell me the specifics but they were more troubling than what I had known. Toward the end of the semester, she told me that her father was coming to retrieve her before the end of classes. She explained that she was going to be put into some sort of institution to reform her unreligious behavior. I put her in touch with her congressman, Wally Herger, a nice guy, but ultraconservative. Surprisingly, his office seem to have registered a complaint that made it to the Saudi government, leading to a letter telling a student should not have to return right away. Again, I repeat that I may not have all the facts correct. A few months ago, I was asked to write an article about my experiences as an undergraduate student of Wolfgang Stolper, probably based on a conversation that I had with Mike Scherer. After I submitted it, the editors told me that they wanted details about Stolper’s relationship with Schumpeter, when my conversation with Mike had concerned my lack of any real knowledge of the subject — as the following note will prove. First of all, I am flattered to be even vaguely associated with such world-class intellectuals as Mark Perlman, Wolfgang Stolper, and Joseph Schumpeter. I learned about the relationship between Wolfgang Stolper and Joseph Schumpeter as a very young, naïve, and certainly unpromising student. I switched majors every year, a symptom of both my entirely unsystematic manner of learning and my hunger for new ideas. I only took one international economics class with Professor Stolper in 1959. The course was the most unique educational experience of my life. More often than not he would begin class by handing out papers, explaining that if he were actually going to talk about economics, this is what you would say today. Instead, he would tell us about an upcoming event on campus, whether it was E. Power Biggs, who was going to play Bach on the great organ, or Paul Tillich, who was going to lecture on theology. The rest of the class would be devoted to alerting us to the fine points of the forthcoming presentation ‑‑ its context, its importance, and most important what to look for while attending. Someone told us that Professor Stolper had made his living for awhile writing Ph.D. theses for wealthy students in various disciplines. I have no idea if this story was true, but judging from his performance, I would not doubt it for a minute. In any case, this class was ideally suited for an enthusiastic student like me. Needless to say, virtually everything in his lectures was over our heads, yet we were keenly interested in what he said, realizing that it was significant. Although I was not a bashful student by any means and I found his information fascinating, for some reason the idea never entered my head to approach him to ask for elaboration or clarification of any of his classes. I do not recall any of the other students talking with him after class either. However, one recurrent theme in the class is etched in my memory. Professor Stolper often spoke of one person of great importance about whom none of us had ever heard. He probably wrongly assumed that students educated enough to be admitted to the University of Michigan would certainly be familiar with the name Joseph Schumpeter. Of course, we were not. I have no recollection of any theoretical analysis of Schumpeter ‑‑ only that he was a denizen of Old Europe who led a remarkable life. Professor Stolper told us riveting anecdotes about Schumpeter, including his three great ambitions to be the greatest economist, the greatest horseman, and the greatest lover. Something that sounded so outlandish was sure to capture undergraduates’ attention. One particular story that was firmly imprinted in my mind concerned Professor Stolper’s departure from Europe with Schumpeter. He told us that when Schumpeter was about to depart for Harvard, a man limped up to embrace him, telling him something like, “I can never thank you enough Professor Schumpeter. You, a captain in the cavalry, were willing to duel with me, only a lieutenant in the infantry.” Professor Stolper explained that Schumpeter had made some disparaging remarks about the service that the librarian had given his students, so the librarian challenged him to a duel. I later read accounts of the duel, but nothing about either the wound or the final embrace. Maybe Professor Stolper embellished a bit, but it was certainly an excellent teaching technique to make students take an interest in more important matters. I suspect all the other students in the class would also still have a strong memory of the story. If you were to ask me what, in particular, we learned in the class, I would not be able to offer you much. Yet I feel confident that like other fellow students I benefited by unconsciously soaking up ideas, without any recollection of their source. For example, I have absolutely no recollection about any of Schumpeter’s theories being discussed in class. Yet, decades later, I found strong parallels between Schumpeter’s way of looking at the world and my own. For example, I became fascinated by the way that the leading economists in the United States analyzed railroads, and other capital-intensive industry. Afterwards, I realized that their analysis was almost identical to that of Schumpeter, especially the Schumpeter of Capitalism, Socialism, and Democracy ‑‑ so much so that I was led to believe that they may have been an unacknowledged source of his work. Of course, both Schumpeter and the American economists were well schooled in the work of the German historical school, which may just as well explain the commonality. Of course, Schumpeter may well have unconsciously assimilated Wells’s notions just as I have done with those of Schumpeter and Professor Stolper. A few years ago, Professor Stolper stopped by the History of Economics Conference. I told him how inspiring his class was. He seemed a bit embarrassed, or even puzzled, telling me that my response was surprising because people had told him that his teaching was not very good. How wrong he was! I like to imagine that if Stolper imbued the essence of Schumpeter, my brief and distant encounter with Stolper while sitting in the second or third row of a dingy room in Ann Arbor provided a vague and distant relationship with both great economists. Atkinson, Edward. 1889. The Industrial Progress of the Nation: Consumption Limited, Production Unlimited (New York: G.P. Putnam; repr. New York: Arno Press, 1973). Perelman, Michael. 1995. “Schumpeter, David Wells and Creative Destruction.” Journal of Economic Perspectives, Volume 8, No. 4 (Summer): pp. 189‑98. Wells, David A. 1885. Practical Economics: A Collection of Essays Respecting Certain of the Recent Economic Experiences of the United States (G.C. Putnam; NY: Greenwood Publishers, 1968). ___. 1889. Recent Economic Changes, And Their Effect on the Production and Well‑Being of Society (NY: Da Capo Press, 1970). Why am I not surprised that the newly announced Milton Friedman Institute will be located in the former Chicago Theological Seminary? Over the last three days the Washington Post has been carrying a front page series on the horrors inflicted by ICE, the Immigration and Customs Enforcement branch of US Homeland Security against people they want to deport, which includes even long-term resident aliens with green cards, who are found to have committed a felony in the past, even the very distant past. People who contest their deportations are kept in remote jails with poor access to lawyers or their families and often little medical care. The first story told of a man who died and was buried and nobody can find out officially what he died of. The laws supporting this were passed under Clinton in 1996, but the strict enforcement has come down from Bush since 2003, when ICE was formed along with the Department of Homeland Security, all part of post-9/11 anti-immigrant hysteria. On Tuesday there was a story of a woman who came from South Korea in 1975 and was living in Florida, married, whom they want to deport because she purchased stolen jewelry over ten years ago. She apparently has cancer, but they are not letting see a doctor, and her husband and lawyer cannot see her. On Wednesday, the story was of how people actually being deported are given powerful and dangerous psychotropic drugs who have no medical problems, a practice banned in many countries specifically and againg international law. We are living in a horrifying police state, but most do not know of this. I have become more conscious of this recently because of a friend, here since he was ten years old who became seriously depressed after ICE began to try to deport him for a minor crime he committed over a decade ago. They are still trying, but at least he is not incommunicado in some obscure jail in the Arizona desert. Or so the sign says in Uncle Sam’s Petroleum Saloon, a.k.a. the US Energy Information Agency. Take a look at the monthly forecasts from February to May—the price of oil is always supposed to go down, wherever it is. I’d love to look at the model that generates this serial silliness. McCain gave a major policy speech on climate change yesterday. Politically, we might consider this a lower bound on potential federal action next year, so here is a rough assessment of its hits and misses. 1. Sizing up the problem: McCain is forthright on much of the science of climate change. He recognizes it is happening now and is likely to intensify, that human alterations of the carbon cycle are responsible, and that it is imperative to reverse this trend. To put it mildly, this constitutes a big shift away from the doctrine that currently rules Washington. He can be faulted, however, for failing to draw attention to the very real threat of catastrophic climate change Weitzman, among others, has been calling attention to. 2. Mitigation: Many of the consequences of climate change, like sea level rise and disruptive changes in precipitation patterns, are already in the pipeline. McCain recognizes this and accepts a federal role for helping communities defend and cope. I give him credit for this. 3. Instituting a carbon cap: McCain, as he has for several years, endorses a nationwide carbon cap. He is a bit vague on how far upstream he would impose it. This is a rather wonkish topic for a campaign speech, but it has a lot of practical importance: the further upstream the cap, the less scope there is for playing politics with coverage. 4. Emissions target: McCain wants a 60% reduction by 2050. Mainstream opinion, reflected in the Clinton and Obama proposals, targets an 80% reduction, and even this may not be enough in light of the evolving understanding of positive feedback mechanisms in global carbon cycling. In my opinion, however, this is the least significant shortcoming of McCain, since the cap mechanism would readily enable progressive tightening as the political will materializes. 5. Offsets: This is a big problem. McCain headlines his enthusiasm for offsets, suggesting that 40% of the emissions target can be reached simply by trading off for carbon sequestration in domestic farmland. Despite his assurances, it is highly unlikely that offsets will achieve true additionality, not to mention the still uncertain state of our understanding of long run carbon cycling in forests, farms and soils. In my opinion, one should deduct the amount of offsetting allowed to estimate the true cap. If McCain will accept offsets up to, say, 50% of his cap, he is guaranteeing a reduction of no more than 30% by 2050. Obama and Clinton, by contrast, eschew offsets. And offsetting is a political nightmare, dangling billions of dollars in manufactured profits in front of business interests and creating the biggest rent-seeking operation in human history. 6. Allocation: This is another big problem. McCain will simply give away all the permits at the beginning, and in his speech he offers only the vaguest of promises that some portion will be auctioned in the future. Every citizen should know that a cap will causes consumer prices to rise for carbon-intensive products, and if producers get the permits for free they keep the difference. Giving out permits is giving out profits. Every permit should be auctioned from the get-go, and Clinton and Obama are both in accord with this principle. 7. Recycling: If some of the permits are eventually auctioned, McCain would have the government keep the revenue and use it to make infrastructure and other investments. It is easy to see the rationale for this approach, but it is nevertheless a mistake. As much of the revenue as possible should be recycled to households. There are three reasons for this. First, the price increases resulting from the cap will take the form of a highly regressive sales tax, hitting low-income families the hardest. This effect needs to be countered by progressive recycling. Second, the price increase, like any tax, will have a depressive effect on the economy. In theory, if the government could spend the money as fast as it takes it in there would be no problem, but experience shows this is difficult to achieve. It is better to reinject it back into households. Finally, we are talking about a concentrated effort that will have to continue for over 40 years—at least two generations, without so much as a pause. To make the political support for a rigorous climate policy bulletproof, household incomes have to be protected. The climate plan of the future has to be like Social Security, so financially beneficial for so many people that its most rabid ideological opponents will not be able to dent it. 8. Border adjustment: McCain explicitly supports a carbon adjustment tax to prevent leakage via international trade. This is a necessary and important feature. 9. Nuclear energy: A lot of environmentalists are going to focus their ire specifically on McCain’s enthusiastic support for the nuclear option. At the risk of alienating all of my green friends, and the green half of my own brain, in light of the extraordinary risks of catastrophic climate change I think nuclear power has to be given an unbiased look. On the other hand, if it is to have a future, it must be one that does not depend on artificial subsidies, such as the Price-Anderson cap on liability and the failure to safely close the fuel cycle. 10. Regulation and public investment. McCain talks as though, once we’ve set the right price signals via a carbon cap, the magic of the marketplace will take care of the rest. Would that it were so. For better or worse, however, a nationwide cap will require complementary policies at all levels to make adjustment smoother and more manageable. Fuel, appliance, and construction standards will all have to be raised. Government will have to make large investments in research and development. Above all, we need a crash program in new, energy-saving infrastructure in our electrical grid and especially mass transit. These policies are not alternatives to a cap: they make it possible to meet the goals of the cap without bringing the economy to a standstill. Because the investment portion of this program will not begin to pay off for several years after it begins, there is a strong case for starting it before the cap goes live. So here is my overall assessment: McCain’s approach represents a real improvement in some respects, but it falls far short in others. I’m not worried about the weak target; we can fix that as the need becomes clearer. The permit giveaway and the offsets are much worse, because they will create powerful constituencies determined to keep the spigot open and flowing. Failure to recycle will poison the political climate, creating the impression that to be for a responsible climate policy is to be against the living standards of working class America. And we can’t afford further delay on the wide range of regulations and investments we need to make a carbon cap succeed. This has nothing to do with what you may think about the good reverend’s jeremiads, some of which I think are right on target and others bizarre. It’s about a battle of racial subtexts. It also poses another problem for Obama down the road. Quite a few voters think he’s a Muslim, and the web rumor mill will crank this up to a fever pitch as the election approaches. The simplest rebuttal would be to emphasize his church-going, but this will remind people once more of Wright. Forget about the flag pin; Obama needs to wear a giant neon cross. In their Industrial Democracy, Sidney and Beatrice Webb raised an interesting point I'd like to follow up on. They observed that, "Restriction of output is, in fact, an employer's device, not a workman's..." and went on to cite the "Coalowners' 'Limitation of the Vend'". The Webb's were discussing frequent complaints that trade union policies restricted output. They argued that although some unions did indeed advocate the restriction of output, they had little power to enforce such demands. Restriction of output is the essence of economists' lumpoflabor fallacy claims. Ironically, the Webbs, in disputing the salience of such claims, are one of the few sources that presented evidence that some unions, at some times, did exhibit lumpoflaborite beliefs. 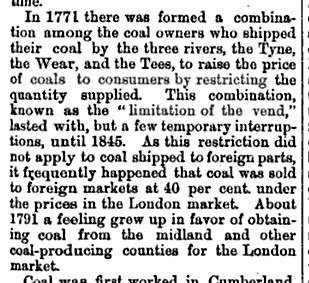 Now, remember coal was a BIG DEAL in the days of the Industrial Revolution, so restricting its output to boost its price would have been a BIG DEAL in the economic history of Great Britain. Paul Sweezy studied it back in the day. So naturally I wondered how many 20th century economics textbooks even mentioned it. Not just any textbooks but those that made a big deal about lumpsoflabor. I've collected 580 sources from Google Books, over a hundred of them have every appearance of being textbooks (ie., 600-800 pages long with titles like "Principles of Economics"). The answer: 0. Well, alright... "limitation of the vend" may be a bit narrow and obscure. How about "price fixing", then? Of the 580? Three mentions. With all their ranting and raving about alleged beliefs of workers, most economics textbook authors managed to mantain a discrete silence about the documented activities of capitalists. This is significant because to the extent workers might have had the views claimed by economists, it is plausible that they acquired them not by invention out of thin air but by observing capitalism in practice. Students at the University of Notre Dame are petitioning their administration to hire more economists who will teach about "heterodox theories" and adopt a "plurality of views," along with emphasizing an "overview of the history of economic thought." One can access the petition to read it more thoroughly (and maybe sign it) at http://www.petitiononline.com/econnd. This is a followup to the scandalous situation at ND where in 2003 the administration took away the graduate program in economics and gave it to a newly formed "Department of Economics and Econometrics," which describes itself as "neoclassical." The administration has been spending huge amounts of money to bring in people as chaired professors who have published articles in the AER, JPE, QJE, and JET. The dean there wanted a department with a high ranking, with such rankings being determined by pubbing articles in such journals. Publishing books do not count. So, Phil Mirowski in the old department, has published books that are far more influential than anything published by any of these new hires, but they do not "count." Frankly, the ND administration is wasting its money, besides contributing to the narrowing of economic thought and perspectives. They could have spent half as much and gotten themselves the leading heterodox department in the US, maybe even in the world. As it is (and I am not out to insult particularly anybody in this new department), the best they will do is what Robert Solow said when he opposed all this back in 2003, that they will get a "third-rate version of the MIT department." He said that was not what we needed, and I agree. In case you were wondering how deeply Paul Krugman’s judgment could be impaired by his attachment to Brand Hillary, Exhibit O (for oil) is today’s post on his NYT blog. He argues that, unlike the differences between Obama’s and Clinton’s health care plans, their split on gas taxes is minor stuff. Economists are miffed at HC because tax incidence is their lamppost, says Paul, but what to do about high oil prices is second order. The best that can be said for the gas tax holiday is that, in its Clintonoid version, it is nearly pointless. A few cents per gallon get shifted from federal taxes to oil companies, since price at the pump is largely governed by demand, and then they get shifted back to the government with Hillary’s windfall oil profits tax. It is a big, meaningless shuffle that sells itself as populism. Since the dollars more or less end up in the same pockets they start out in, you might say Krugman is right. But this is not why the vast majority of economists are perturbed. Yes, there is a matter of professional pride at stake, but it is more justified than Krugman is willing to admit. Clinton’s proposal, featured in her latest round of TV ads, is transparently dishonest: it promises something she and every reasonably well-informed observer knows to be false. The appropriate analogy is not to disagreements on trade, which Krugman brings up, but to supply-side snake oil, the claim (which McCain seems to be embracing) that cutting taxes raises revenues. The issue is not good versus bad policy, but honesty versus dishonesty. Economists are trained to see the cynicism behind such ploys, and they do a service to call attention to it. But there is an even bigger issue lurking just beneath the surface. Without a doubt, one of the biggest challenges all of us, in the US and around the world, will face during the coming years is the increasing scarcity and rising price of oil. We will experience this as a threat to our living standards, a barrier to global rebalancing (getting the US trade deficit under control), and perhaps even a trigger for catastrophic military confrontation. (For a blast of sanity on this last point, see Michael Klare.) At the same time, the imperative of reducing carbon emissions will require us to wean ourselves from oil even faster than market forces alone would dictate. Of course, no rational politician will tell us how he or she plans to get us out of the era of cheap oil. Any discussion of politics has to take place against a backdrop of cowardice and insincerity. That means we have to read the tea leaves, like the current dustup over whether to suspend gas taxes. So what does this “unimportant” proposal say about Clinton’s plans for a future oil policy? Taken at face value—and how else should we take it?—it suggests that she will delay measures to reign in demand or even try to subsidize fuel consumption for short term political advantage. Unless this election-year idea is just a charade, it portends a phony populism that places our well-being, and possibly our survival, at even greater risk. Here is the short reply to Krugman: yes, health care is very important, but taking proactive measures to transition our economy out of dependence on oil is very, very important. Anyone with even a modest training in economics understands that promising the public more oil at cheaper prices, even for a few months during an election year, is profoundly wrong-headed. I signed the economists' petition. I wonder what petition on this subject Paul K. would be willing to lend his far more valuable name to. I am not a fan of Brad Delong's "death spiral" stuff about the major newspapers, but today the Washington Post was worse than usual, putting a column by Jackson Diehl in a box on its editorial column page. In this column Diehl compares the US situation in Iraq with that of Israel in Gaza and Lebanon, in particular claiming that both are facing bad people firing rockets with bombs at them. Now, I am not going to defend Israeli policy in either Gaza or Lebanon at all. However, this comparison by Diehl is a slander on the Israelis, at keast in comparison with the US policy. In both places, Israel withdrew its military (and in Gaza its settlers), actions that have been followed, especially in Gaza, by said rocket bombing campaigns. However, in Iraq, Moqtada al-Sadr had declared a cease fire, which was in place and holding and credited by many with playing a major role in the reduction in violence that the administration touted as evidence of the success of its "surge" campaign. Then, for no clear reason whatsoever, the US supported an unprovoked military campaign by the al-Maliki government against the Sadrists, first in Basra, then in Baghdad, attacking the 2 million people in Sadr City there. The rocket-bomb attacks on the Green Zone out of Sadr City have been in response to this campaign, which continues to go on, and included killing 30 people in a hospital the other day. On top of this, the US spouts misinformation about the sources of the Sadrists's weapons (from Iran!!! ), claims not actually supported by a major Iraqi official spokesman, who agrees there are some weapons from Iran, but not clear they came from the government (especially as Iran is backing the government over the Sadrists, according to credible reports). But, again, the US government spouts drivel, and Jackson Diehl seems to be a complete tool in this, along with WaPo. How will I spend my gas-tax holiday?!! Can I go to Guam on the savings?! I don't know about you'all, but before the McCain/Clinton Promise, I was as angry and bitter as a professor grading final exams could be. Now, it's A's all around. Even for those who tell me that inflation is bad because it reduces purchasing power. Necessary Sacrifices for Environmental Sanity? According to the Wall Street Journal, golf courses consume enough water to supply the household needs of two-thirds of the U.S. population. Can you imagine the ruling class acting to limit its favorite "sport"? Newport, John Paul. 2008. "Play It as It Dries." Wall Street Journal (3 May): p. W 1. Nationwide, golf-course irrigation consumes less than half of 1% of the 408 billion gallons of water used daily, a golf-industry report concludes. Even so, that's a lot of water -- two billion gallons a day, or enough to satisfy the household needs of more than two-thirds of the U.S. population, according to the U.S. Geological Survey. Conservative Boris Johnson was elected mayor of London yesterday. Mr. Johnson first came to the Sandwichman's attention two years ago with his imaginative description of the lump-of-labour fallacy as "Colbertian". The reason the French have massive and chronic unemployment is that they are governed by an élite still gripped by a demented belief in the Colbertian lump-of-labour fallacy. They have excessive taxation, regulation and bureaucracy, and the last thing the French (or anyone) need is more detailed prescriptions from Brussels about the labour market or anything else. Meanwhile, his Wikipedia entry describes Mr. Johnson as is a "self-centred pompous twit" who "cultivates an image as an eccentric, straw-haired fop, disorganised and scatty..."
''It would be unfair to say it looks as if he dresses at a charity shop, because no charity shop would accept stuff in that condition.'' (Simon Hoggart, The Guardian). You just can’t keep a bad idea down. The New York Times, reporting on Europe’s economic angst here and here, wallows in money illusion. Let’s survey the scene of the crime and speculate on the motives. So what are the real problems? The biggest one is income distribution, which is becoming more unequal across the continent as moderating institutions are eroded under the pressure of global competitiveness. This has the most immediate effect on workers who produce goods and services for export or which compete with imports, and it spills over into other labor markets as the wages of the most vulnerable workers slip backward. Firms are also adjusting their organizational strategies to the new world of global competition, relying progressively less on long-term relationships with employees shielded from market forces. Another possibility, hinted at in these articles, is an adverse shift in the terms of trade, as oil and gas imports become more expensive relative to manufactured exports. Food is less clear, however, since Europe exports vigorously (and controversially) in agricultural products, which leads one to wonder where are the farmers, and those who sell to them, in these tales of Euro-woe. By blaming the deterioration in living standards on the wrong culprit, these stories detract attention from the true causes. The ECB can crank its rates as high as it wants in order to snuff out inflation, but this won’t restore real income to the average European—quite the contrary, actually, since high rates will produce more unemployment while further elevating the already too-high euro. Wrong diagnosis, wrong treatment. The question that comes to my mind is why this nonsense about inflation lowering real incomes still has traction after all these years. The disproof is no more complex than the old, familiar circular flow diagram. My suspicion is that it can be attributed to the fundamental political economy fact about inflation: that unanticipated increases in inflation reduce the wealth of net creditors, who map more or less perfectly on the rich as a whole. There will always be a need to find a reason to make inflation the scapegoat for whatever ails the general public, and simple logical error will not constitute a disqualification. On 4 May 1886, about two thousand Chicagoans gathered at Haymarket Square to protest against the city's police, who had shot and killed at least two striking workers outside the McCormick reaper factory on the previous afternoon. The demonstration was peaceful, and only a few hundred people remained when, late in the evening, 170 Chicago policemen suddenly arrived and demanded that the protesters disperse. Nonplused by the anticlimactic arrival of the police at the close of a peaceful rally, Samuel Fielden, the evening's last speaker, pointed out the meeting's non-violent nature in response to the peremptory dispersal order. At this point in the exchange, someone tossed a dynamite bomb into the police ranks. The explosion immediately killed Officer Mathias Degan, wounded several others, and prompted a cacophony of gunfire, most of it from police pistols. In the chaos, the police shot several of their own officers as well as many of the fleeing civilians. While the number of dead among the police rose to seven over the next few days, the actual number of casualties among the protesters, like the bomb thrower's identity, was never determined. It was a kangaroo court with a rigged jury and predetermined outcome. Four of the convicted men were hanged. Louis Lingg escaped the noose by taking his own life. The remaining three were freed in 1893 by Illinois Governor Altgeld because they – and the dead men – were innocent of the crimes for which they had been convicted. Ira Steward was a pioneering American labor leader and early proponent of the eight-hour day. His wife, Mary, is said to have written the couplet, which became popular among eight-hour day activists in the 19th century, "Whether you work by the piece or you work by the day, decreasing the hours increases the pay." Frank Fetter was an economics professor in the early 20th century and an early adherent in the US to the Austrian school of economics. His textbook, Economics, published in 1916, contained one of the earliest textbook treatises on "the shorter day and the lump-of-labor notion." In his discussion, Fetter argued that the view that the shorter day would result in higher pay is "connected with the lump of labor notion" and is based on the assumption that "there is so much work to be done regardless of wages." Although the dismissive phrase "fallacy of the lump of labour" had been coined by an economist, David Frederick Schloss, its use as a conclusive put-down of eight-hour day advocates was charted by the same yellow journalism pack of newspapermen who hanged Parsons, Engel, Spies and Fischer. To be fair to Fetter, his overall discussion of the shorter day did acknowledge the potential benefits of reduced working time. But his discussion was contorted into a frame that emphasized the supposedly fallacious thinking of eight-hour day advocates. No mention there of hanged labor leaders or lynch-mob newspapers. Fast forward to 2004. Professor Arie Kapteyn was lead author of an article titled "The Myth of Worksharing" published in Labour Economics. An earlier version of the article was issued as a discussion paper in 2000 by the Institute for the Study of Labor: "a place of communication between science, politics and business." One of the Institute’s current priorities is "mobility and flexibility of labor markets." In public discussions the idea of worksharing often emerges as a potential instrument for reducing unemployment… However, economists as well as employers are mostly skeptical about the success of this policy prescription. The fallacy of this seemingly simple idea is made clear in the literature especially by its impact on wages, wage costs, and output. A footnote on "fallacy" cites a 1997 Economist article, "One lump or two?" "It is depressing that supposedly responsible governments continue to pretend to be unaware of the old 'lump of labour' fallacy: the illusion that the output of an economy and hence the total amount of work available are fixed." Aside from the unequivocal title of the article and the confidently formulaic framing of worksharing as being based on a fallacy, the paper’s conclusions are equivocal. The results from the authors’ literature survey are inconclusive. Their empirical analysis "does not provide any ground for the proposition that worksharing would reduce unemployment," which is a rather weaker claim than the "myth" and "fallacy" labels would suggest. And, hey, who knows? Reduction of working time might be a good thing ("welfare enhancing") after all. Thus, the picture emerges that a reduction in working hours causes an increase in the real wage rate and, consequently, annihilates positive a direct effect of a reduction in working hours on the employment rate (Table 3) and turns it into a (insignificant) negative effect (Table 5). Or, as a partial effect, "a one percent reduction in working hours results in a 0.38 percent increase in the employment rate and a 1.15 percent increase in the real wage rate." Substituting the wage equation into the employment equation, Kapteyn concludes that a "one percent reduction in working hours results, in the long run, in a 1.04 percent increase in the real hourly wage rate." Suggesting – as Mary Steward’s doggerel had it (and contra Frank Fetter) – that, "decreasing the hours increases the pay." The bad news… wait for it… is that after substitution the employment rate goes from a 0.38 increase to a 0.27 decline that Kapteyn labels "insignificant". I’m guessing that means statistically insignificant. Which is to say, the model-building empirical mountain labored and gave birth to a mouse. Reading the fine print, there’s all sorts of stuff I could take issue with in the paper’s model specification. But to do so would be academic in the who-cares sense of the word. The point remains that the model-building, ‘empirical’ hocus pocus takes second billing to the myth/fallacy genuflection – a fallacy cut from the same evidential cloth as the Haymarket convictions in pursuit of the same end: suppression of the workers’ movement for an eight-hour day. The idea of work sharing as an employment creation policy is simple: if the production of goods and services in an economy is fixed, then a reduction in hours can re-distribute the fixed amount of work across more people, increasing employment. In spite of its intuitive appeal, economists and policy makers are skeptical about the success of work sharing as it is rooted in the so-called “lump-of-labour fallacy”: the false premise that the amount of output in the economy is fixed. They then go on to "analyze" the effects of the French policy using a model that presupposes precisely the optimizing equilibrium relationships between hours, wages and employment that the real theory of the hours of labor – Chapman’s – puts into question. The problem is, if you understand the implications of Chapman’s theory, you can’t do the kind of model building these folks do to “find” the conclusions they do. Why? Because the whole model building enterprise is explicitly predicated on a suspension of Chapman’s theory. It would make as much sense to conclude that since Parsons, Engel, Spies and Fischer were hanged, they must have been guilty. The great "myth of worksharing" is that these economists who purport to analyze it empirically are doing any such thing. The touchstone is the ritual incantation of the bogus lump-of-labor fallacy claim. Is there no economist with the integrity to stand up and defend the lump of labor fallacy claim that they reiterate with such abandon? Or are they like the jurors at the trial of the Haymarket martyrs? I am offering a $10,000 prize, in Canadian funds, to be awarded to the author who directly and conclusively refutes the argument in "Why Economists Dislike a Lump of Labor," (Review of Social Economics, September 2007). My argument is that the authenticity of the lump-of-labor fallacy claim, with regard to unemployment and the hours of work, is questionable; that various explanations of it are inconsistent and contradictory and that Sydney J. Chapman’s neglected theory of the hours of labor presents a more coherent analysis of the reduction of working time than the often-cited fallacy claim. The article must be accepted for publication in one of the 30 top-ranked economics journals. Only anonymously peer-reviewed articles are eligible, not book reviews, commentary or other journal front or back matter. Journal rankings will be taken to be those specified in Kalaitzidakis, Mamuneas and Stengos "Rankings of Academic Journals and Institutions in Economics." Journal of the European Economic Association 1 (December 2003). Enter by notifying me, Tom Walker, by mail or email that your article has been accepted for publication in one of the qualified journals. Mail address is 1204 Lakewood Drive, Vancouver, BC, V5L 4M4. Email: lumpoflabor [at] gmail [dot] com. Deadline for entry is 11:59 p.m. on January 31, 2010. In the event an article is under review by a qualified journal on the deadline date, an extension may be granted provided the article was submitted to the journal on or before December 31, 2009. All requests for extension of the contest entry deadline must attach a copy of the submitted draft. If no contest entry meets all of the above criteria, a consolation prize of $1000 Canadian may be awarded to an anonymously peer-reviewed article meeting the core argument criteria, published in a journal ranked 31-159 by Kalaitzidakis et al. Articles published in a non-ranked journal and articles submitted to but rejected by an economics journal may be given consideration for the consolation prize at the sole discretion of the contest organizer. Prize money will be awarded only to the author or authors of the article specified in the winning entry. In the event of group authorship, prize money will be divided equally between the authors unless specified otherwise and agreed in advance by all authors.